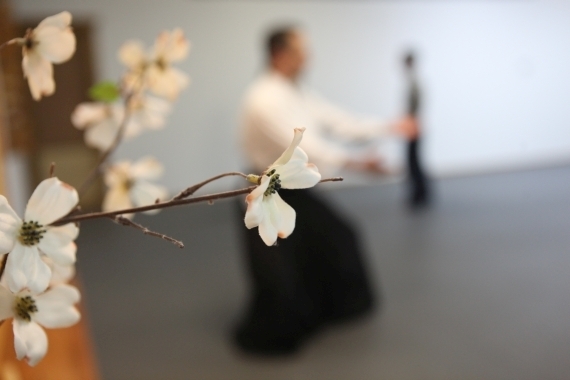 Gentle Aikido Classes are designed specially for mature adults. With small modifications everybody at any age and condition can practice (with success) Aikido. O Sensei (Aikido founder) actively practiced Aikido to age 86! Please accept our open invitation to visit and experience our unique practice. We would like you to try a class before you join the dojo. Aikido is a commitment and we would like to provide you with information and experience to enable you to make a best decision for you. Only you know if Aikido is right for you at this time in your life. Wear loose-fitting, comfortable clothing. Although you are welcome to purchase a training uniform (gi), it is not required to begin training. If you wish to buy a gi, they are available for purchase at the dojo. A gi is recommended for students planing to continue Aikido long term. Please remove all jewelry before class. As a newcomer to Aikido, relax and enjoy beginner's mind. This is a special time, when you will be presented with and attempt to digest a huge amount of new information for the body, mind and spirit. It is normal to feel awkward and uncoordinated in the beginning. Aikido looks simple and self-evident. However, it takes time and practice to integrate the new information into your body. In a short time the movements will begin to become familiar, the body more flexible, and the thinking process less rigid and reactive. Aikido is available to all who persevere. Training gives us an opportunity to move beyond what we thought were our limits and explore the part of ourselves that has an unknown potential. Upon visiting and watching or participating in a class, you will have the option to enroll. If you decide to join our dojo, one of our instructrors will assist you with the enrolment. The initial training will introduce you to the basics of the art, get you familiar with the etiquette and formalities. And since we are a traditional dojo, we don't require contracts, or ask that you commit to an initial term of membership. We encourage you to contact us via our Contact Page or by telephone at (407) 284-9598. We can provide you additional information (not already on this site) or set up a visit with you so you can watch a class. We'll make sure that a member will take time to meet and greet you, as well as provide you information about the dojo.